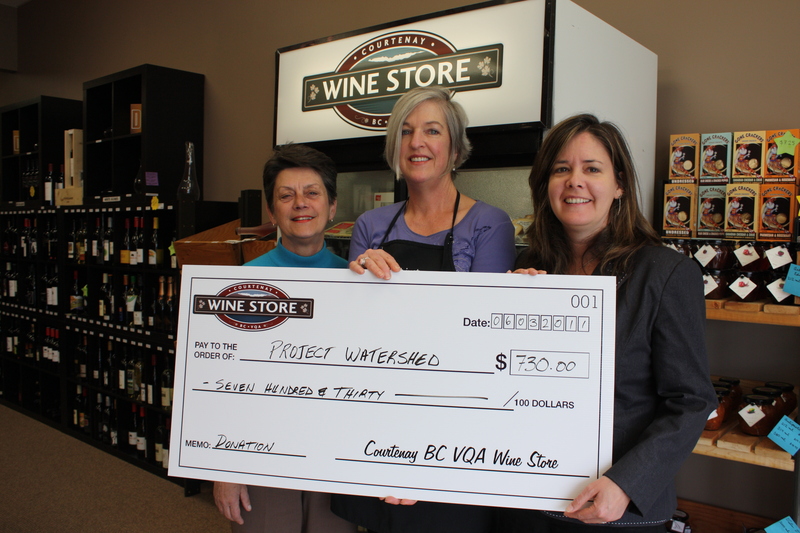 Pictured: Gerti Roither (winner), Cindy Holland (store owner) & Valeri Diamond (Project Watershed). 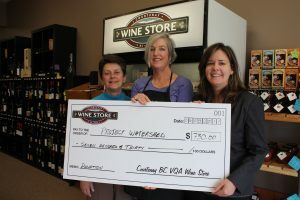 Project Watershed would like to thank Cindy Holland of the new Courtenay VQA Wine Store on Cliffe Ave for the donation of their raffle proceeds to Project Watershed. Cindy contacted Project Watershed wanting to donate the proceeds of their raffle for two nights accommodation for two at Fred Tibbs seaside condo along with two tickets to the Tofino Food & Wine Festival – Sat. 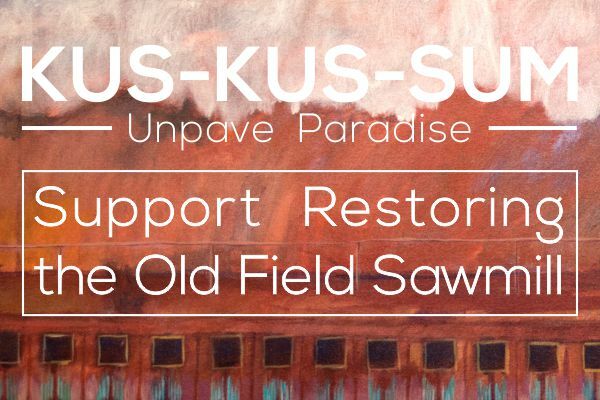 June 4th, “Grazing in the Gardens” event at the Tofino Botanical Garden. Kira Rogers and Eli Blake, Directors of the Tofino Food and Wine Festival donated the tickets to the event, and Cindy purchased the accommodation at a reduced rate given the nature of the fundraiser from Tofino Vacation Rentals. The draw took place during the month of May and a total of $ 703 was raised. The lucky winners are Gerti Roither & Al Wainwright. Cindy said that she wanted to raise money for Project Watershed as her formal post secondary training is in Groundwater Engineering and she also spent several years as a member of the volunteer group Regional Watershed Advisory Committee (RWAC) ) for the GVRD (now Metro Vancouver). Cindy adds, “protecting our wonderful resource is not just for today, but for generations to come, and I have total respect and admiration for the hard work your group does”. “We are very pleased that a local business would on their own initiative make a decision to do a fund raiser for Project Watershed. 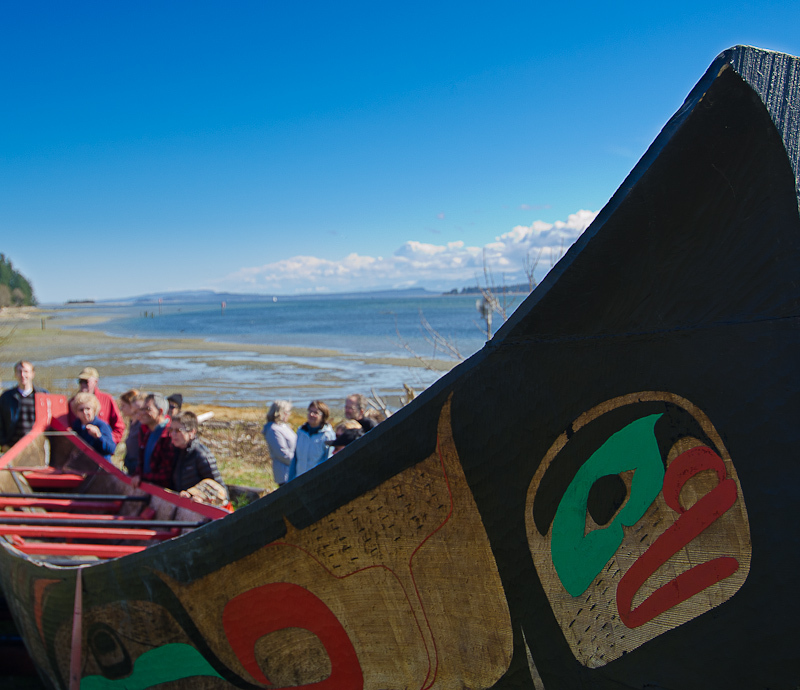 This means our public awareness campaign to educate and inform the public on just how fortunate we are to live in a place where natural wonders like our estuary are worth saving, restoring and protecting, is being acknowledged” says Paul Horgen, Chair of the Board of Project Watershed. 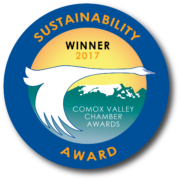 For more information on how you can support Project Watershed, please contact Valeri Diamond at volunteer.projectwatershed@gmail.com or 250-703-2871.